Would You Hang “This” In Your House? Take just a moment to ponder that question in your mind… Would you and I as Christians be willing to place our Relationship with our Lord and God in a prominent place in such a manner that would allow others to gaze in to obtain a peek? Hope you realize something… We already do – it is shown by who we are trusting. Where each of us place our Trust can be seen by even the most distant person we can think of, and most often is easily known by those that are close to us. For instance, an item that we choose to hang in our homes in prominent locations – those that live in that house most likely have a VERY intimate knowledge of whether it is applicable or is merely a decoration placed in that location to suggest something to be the case. There is a Person that knows us better than we do ourselves, the Person of the Holy Spirit, for as Christians we are the Temple of the Holy Spirit. We cannot get to a place low enough, high enough or far enough away that He doesn’t know us intimately and completely. This Series is about understanding that Trust through His Power, His Wisdom and His Grace, can be Full and Complete. For each and every passage presented gives us an insight as to how His Word both Prompts and Encourages us as Believers to follow as our Devotion grows stronger towards Him. 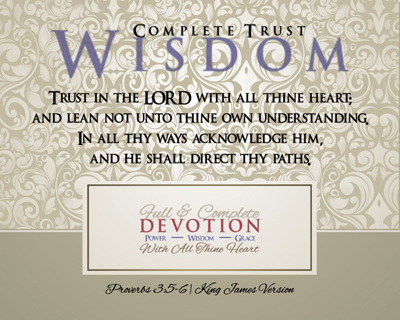 The Complete Trust through Wisdom actually contains the EXACT same verses (Proverbs 3:5-6) that have been used for our daughter’s Baccalaureate and Graduation Commencement Exercises from High School. Interestingly enough, this Series was started at the beginning of those events, which has made it even more special to me for listening to the prompting of the Holy Spirit to engage them in this Series. This Series contains a total of forty-two (42) passages of Scripture in building an INCREDIBLE set of reminders for the Christian as to how Power, Wisdom and Grace come from our Heavenly Father, shown to us through His Word for all to be able to comprehend. Where would we be, if we’d just be honest with ourselves and with our God, today if we as Christians refused to show others a changed life in Christ, as if God didn’t give His MOST precious Son to be the sacrifice for our sins? Take a moment to think about that statement… Unfortunately, that type of behavior and attitude can and does happen to/thru Christians like you and me EVERY single day. What we say, or refrain from saying, could very easily be compared to whether or not we would hang ANY of the prints from this Series in our homes, places of work or in a location where people there know us. We each choose to allow the Holy Spirit to show through us each moment that we live on purpose, or we choose not to allow Him to be seen. I personally challenge you go through each image in this Series, asking yourself whether or not you would put each one in a place of prominence wherever you are, such that others would see it and might ask you a question about it. What type of Devotion do we each have to Him, not just towards Him? It may appear that Salvation is in the cross-hairs of my vision scope – if you have thought that, then you are on the same track with me, for it is because I am! As we are preparing to and are counting down the final days of our daughter’s Senior year in high school, it has been ever on my mind. What if we’d never put her in a Christian school who was there to come along side of us to train our child in the way she should go? Would we so easily be singing the Hymn which this Series got the kick start with, Jesus Saves? Salvation is the most important thing we can help lead our children toward, for it makes the difference in how they eventually spend Eternity. 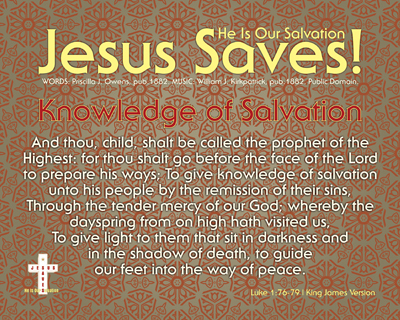 Just what does Salvation mean to you? 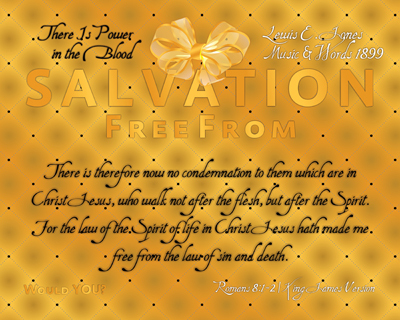 When you and I think about Salvation, what is it that comes to our minds? Only our own experience? Working with young children, especially inner city-kids and those that have the least exposure to church, will present you with a challenge which, for a teacher, is unforgettable. I liken it to the children’s game, 1-2-3 Red Light, they are always interested, but come forward at different rates, with different experiences and show those in ways that must be picked up on – literally on the fly. The game is simple to understand and put into practice. The person who leads is “It” or the “Curator” – they call the shots, like a teacher. All of the remaining players are the “Players” or “Statues” who start off all on the same line, at a distance from the “Curator”, as in the students of a Sunday School class. The person who is “It/Curator”, turns around facing away from the “Players” (like to the white board), and counts… 1… 2… 3… Red Light! While that person is turned around, the “Players” move toward the “It/Curator” as quickly and quietly as possible. If a person is not “still” when the “It/Curator” turns around, that “Player” goes back to the line, starting over on the next counting. The “It” or “Curator” could also say: 1… 2… 3… Green Light, which meant the “Players” could keep moving. The Yellow Light call meant they had to walk, instead of run. Eventually, a “Player” will take the “It/Curator” place when they can tag them before they say “Red Light”. The “Player” then becomes the “It/Curator” and the game resets, beginning all over again. As in the game, the rates of each child getting a solid foundation of Who God the Father is, can be thought of as the rate of how quickly they move towards “It” or the “Curator” who is the one calling the numbers “1… 2… 3… RED LIGHT” and turning around to see who didn’t freeze. Each child will approach at a different rate, with different questions and be in differing states of Conviction. If the child doesn’t understand quite what they are doing, then they reset, if you will, going back to the foundation to start building again. The “Players” will be inconsistent in attendance (unfortunately), due to environment, social dynamics and home situations. Sometimes those kids get reset due to those challenges, which is what makes teaching those children more difficult, and thus all the more rewarding in seeing them Trust the Lord for their Salvation. There is one change in the game that is a “Game Changer” and “Rule Buster” – the teacher WANTS the “Players” to get to him! We should want all individuals to get to the Ultimate Curator – the Lord Jesus Christ, no matter who they are, where they come from, how they got there, when they began or what they’ve done! The Holy Spirit does the Convicting, it is IMPOSSIBLE for us to do so – we are to be guides, FAITHFUL ones to give the Knowledge out. Little can compare to the thrill, humbling and blessing that is received knowing that when one thinks about Salvation, a floodgate of souls come to mind that the Lord has allowed you and I to influence, lead and see become Children of the King, through their acceptance of Christ as their Saviour! This Series is an active part of my life, not a past remembrance of it – one of the reasons these Series are developed. We as Christians need to ask ourselves how active is Salvation to us? The Hymn Jesus Saves is an INCREDIBLE reminder to us of how the Gospel needs to be shared. If you haven’t looked at it lately or may not have ever seen it, read the words. Everything and everywhere are we to be sharing the Good News that Jesus Saves. The seventeen (17) passages of Scripture given that Speak directly (notice the word SPEAK, it is God Who is Speaking) about Salvation, the action of the gift of being Saved. How many come to your mind – people that you and I have shared the Gospel with? There will be tears of sadness, some of gladness, but those are a WHOLE lot better than regret-fulness… Share with someone today that Jesus Saves, as if it were your last opportunity to do so – the rewards are Eternal and the gains are Heavenly – all of which end in VICTORY!!! II Chronicles 18:12-13 | King James VersionIf you would like to be removed from The Encouragement Chronicles, please reply to this e-mail with REMOVE in the Subject Line. Copyright © 2003-2015 DeliverTheWord.com. All Rights Reserved. This Series concept just “popped up” out of nowhere… In the most “unlikely” of places, the “wordle” grabbed my attention on the cover on a journal, not because it had “bad” things on it, but rather the focus of what was being presented in the “sheet wordle” on the front and back covers. More people than before have a tendency these days to have items “represent” them and remind them to be “good” people. Without really taking the time to understand what is behind it, the tendency to be “represented” may be put forth – having NO idea what it really means. The focus or tendency on self can get us as Christians in a whole HEAP of trouble, even if we don’t utter a single word, because what we could be carrying around is speaking for us. Do we have a justification or understanding of what we are casually keeping at arms length as to explain to someone who may ask? That is what gripped me in the rewording and reworking of the “wordle” for both sides of the the journal. We as Christians need to remember that we are the Temple of the Holy Ghost, 365 days of the year, 7 days a week, 24 hours every day. That does not mean that we are to be so straight laced that we put off folks, it is possible to be too right < a Series on this already exists… What is being gotten at is that we have no place to go to be “secular” and be just “spiritual” when we read our Bibles, pray and go to church. The question then would have to asked, “What if God said Salvation was only good or valid during those times you are being “spiritual” and NO good all the other times in our lives?” Am fairly certain that Jesus had to have laughed and shook His head a few times with Peter around – He is the Spirit. The “wordle” in sheet form (what it looks like) gave the opportunity to “Be Creative”, which is what the journal had on the bottom or each page. Notice further tho, that is made to be represented by being “in God’s Will” while doing so. The “wordle” takes a minute to get one’s bearings straight, but once it is accomplished – you may wind up with the same challenge I’m having… You may wind up wanting to share what has been learned behind that words – from the Bible. It has been nothing shy of amazing how each piece of the “wordle” came together with tweaks to make it biblical friendly and something that Christians can use to witness to others as they are intrigued by the design. At first, the multicolored kaleidoscope background was thought to be too engaging for my tastes, but the Holy Spirit challenged me to make it work. The reward is simply priceless. 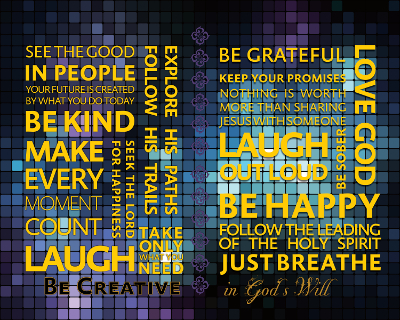 There are seventeen (17) Scripture based prints and two (2) “wordle” prints available in this Series. They are made for individual, standing artwork, but may be combined for a greater affect.